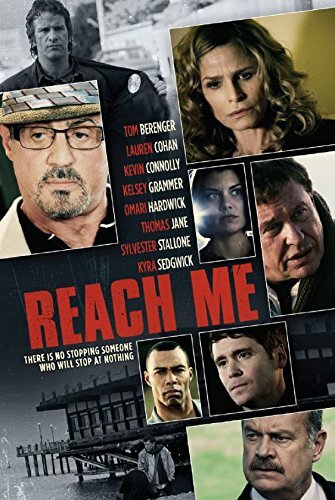 Led by a stellar ensemble cast, the inspirational dramedy Reach Me tells interwoven stories from a diverse group of people who are united by one thing--a powerful book from an anonymous and reclusive author (Academy Award(R) Nominee Tom Berenger; Platoon, History's "Hatfields & McCoys," Inception, Training Day). When the book's positive message goes viral, a journalist (Kevin Connolly; HBO's "Entourage," He's Just Not That Into You, The Notebook) and his editor (Academy Award(R) Nominee Sylvester Stallone; Rocky franchise, The Expendables franchise), a former inmate (Golden Globe(R) Winner Kyra Sedgwick; TNT's "The Closer", Phenomenon), a hip-hop mogul (Nelly), an actor (Cary Elwes; The Princess Bride, Saw, Robin Hood: Men in Tights) and an undercover cop (Thomas Jane; HBO's "Hung") are inspired to change their lives by facing their fears. REACH ME also stars Golden Globe(R) & Emmy(R) Winner Kelsey Grammer (NBC's "Cheers" and "Frasier"), Lauren Cohan (AMC's "The Walking Dead"), Ryan Kwanten (HBO's "True Blood") and Tom Sizemore. REACH ME is produced by Rebekah Chaney, Cassian Elwes, Buddy Patrick and John Herzfeld.